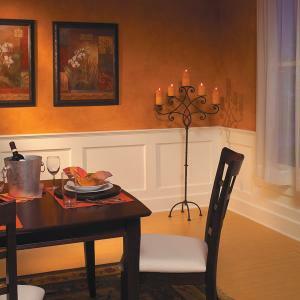 Add texture and depth to your home with these Free Wainscoting Plans. A lot of new “do-it-yourselfers” are slightly intimidated to by wainscoting. Although it does require precision and organization, this plan makes makes it a little simpler to add the elegant look to your home. It looks traditional, yet works in a contemporary setting. I particularly like this style because it is inlaid, and appears as if it was always build to be a part of the wall. It gives a sleeker look compared to the usual mitered molding. Just click on the image for the full how-to woodworking guide. There probably isn’t an easier way to transform a dining room than this wainscoting method. In fact, the interior panel is simply your existing wall. Not only does this save material, but it drops the difficulty level down a notch or two. The lack of the interior panel eliminates the need to rabbet the trim around the panel section. This can als be a terrific wall treatment for a home office space. You can get the look of rich wood with a darkish paint color on the wood and inset panel section.